Spring is the best time to begin an herb garden and in this article I offer tips for growing three classic herbs in containers. Sage, thyme, and rosemary provide multiple benefits: culinary, medicinal and cosmetic uses, and attract native pollinators and European honeybees. These three herbs are considered woody perennials because each year some of their growth turns woody. 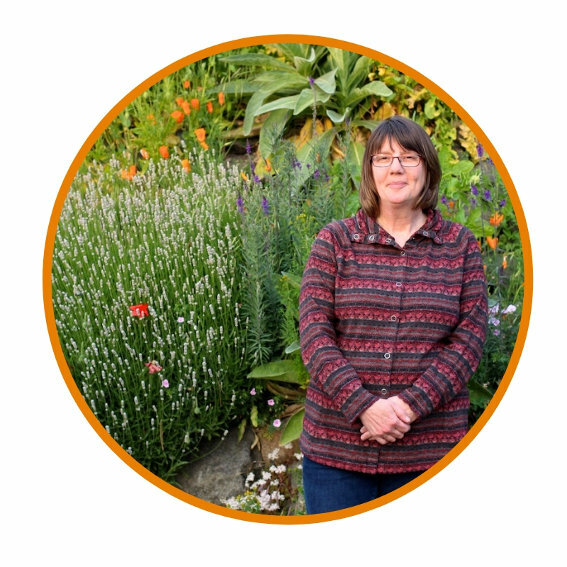 The people who attend my herb-gardening workshops that I teach each year usually have access to a yard and want to grow herbs in a garden bed or landscaped area. But what if you live in an apartment or condo or are renting? People aren’t always aware that many herbs will do well in containers as long as their preferred growing conditions are met. There are three terms used to describe the life cycle of a plant: annual, perennial and biennial. Annuals, like beloved basil and ‘hate or love’ cilantro, complete their life cycle - seed to seed - in one year or growing season. A biennial grows its roots and leaves during the first year, dies down over winter and, during the second year, produces a stalk, flower and seed, dying at the end of the season. Parsley is actually a biennial but we treat it like an annual. Perennials can live for many years and, depending on the climate, can continue to grow throughout the year or go dormant during the colder months. All plants have preferred growing conditions that are based on their native origin. Sage, thyme and rosemary originated in the Mediterranean region and prefer climates that are similar: hot and dry in the summer and wet and cool in the winter. Sage and thyme are considered hardy and will tolerate below-freezing temperatures, snow, and ice. Rosemary, considered a tender perennial, is a little fussier and will not survive the harsh effects of a northern winter. One of the benefits of growing rosemary in a pot is that it can be brought inside during the colder months. Light is an important factor in growing healthy herbs and all three plants need four to six hours of direct sunlight each day during the growing season. Southern and western exposure can satisfy the light needs of sage, thyme and rosemary. Herbs need outdoor living during the growing season but will tolerate an indoor life during the colder months. 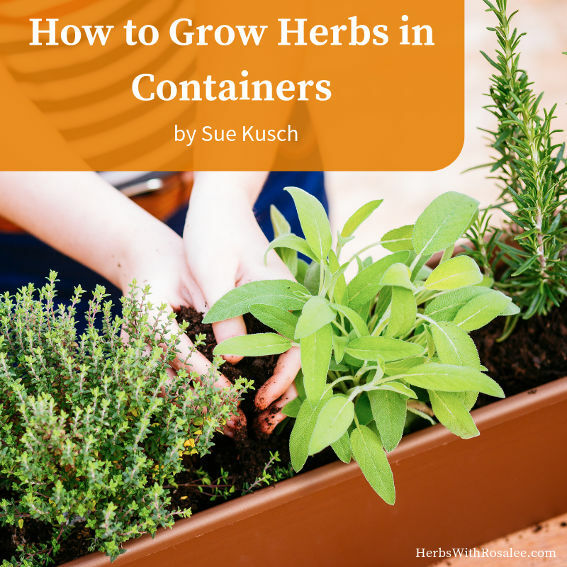 The size of the container is important; the wider the container the bigger your herb plant will grow. A minimum of 10 inches is necessary (measuring across the top of the container) to keep the herbs productive. Ideally, you’ll want to maintain 1-2 inches of space around the root ball. Bigger containers will grow bigger plants but keep in mind the weight if you plan to move them around. Glazed ceramic pots are far better than unglazed terracotta which dry out quickly and will require more watering. If you have freezing temperatures over the winter, you will want to bring ceramic or terracotta pots inside as the moisture held in the clay pots will freeze and crack them. Oak half-barrels are popular and multiple herbs can be planted together but they are heavy and are probably not a good choice for balconies. Small containers like shallow window boxes or pots smaller than 10 inches wide are not ideal for growing productive and healthy herbs. Good drainage is critical; these plants do not like to sit in moist soil for long periods of time. Clay pots usually have one large hole and wooden containers should have multiple holes. Many people recommend putting a layer of gravel in the bottom of containers but it is not necessary provided your soil drains well. Secondhand plates from a thrift store can serve as saucers under the pots and will protect concrete patios from stains. Start with Seed or Plant to Grow Perennial Herbs in Containers? For novice gardeners, I recommend purchasing either young herb starts or mature established plants. 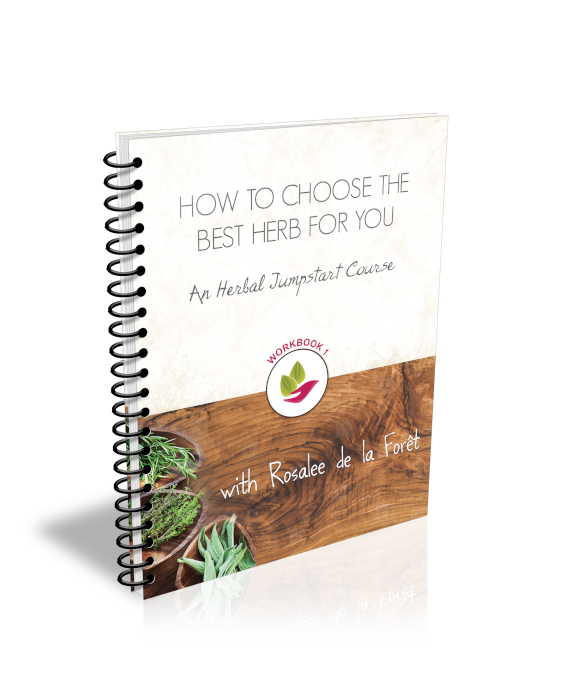 Starting perennial herbs by seed can be challenging and slow growing. Look for organically grown plants at local plant nurseries or online from herb growers. Soil is an important part of a plant’s health and should be alive with microbes. Look for soil that has been inoculated with mycorrhizal fungi, which form a beneficial relationship with the plant’s root system. Adding finished compost to the soil will feed the microbes and sustain the health of the plant. Soil should be replaced each year. Container-grown herbs will need more frequent watering than those planted in garden beds. As mature Mediterranean plants, these three herbs benefit from a thorough soaking once a week or so and then allowed to dry out in between. Younger, smaller plants will need to be watered more frequently. The most common mistake made by novice gardeners is overwatering. Water at the base of the plant directly into the soil rather than watering overhead. Herbs don’t need continuous feedings of fertilizer but a seasonal spray of liquid kelp or fish emulsion would sustain productivity. But use caution: more is not better. Excessive watering and fertilizer can weaken the plant and dilute the volatile oils that provide the aroma, taste and medicinal properties. There are many cultivars (cultivated varieties) of thyme but Thymus vulgaris is the traditional herb used for cooking and for medicinal use. It prefers a well-drained, somewhat sandy soil. Prune twice a year: after the lush growth of spring, cut off the top ⅓ of the plant and dry for winter use. Repeat the same pruning at the end of summer growth. An herb that is undervalued by many, Salvia officinalis offers much more than seasoning for stuffing! Sage likes a rich soil that is well-drained and appreciates the same type of pruning as thyme. The needle-like leaves of rosemary (Rosmarinus officinalis) have a strong floral scent that goes a long way in cooked dishes and baked good. A tender perennial, rosemary will not survive freezing temperatures, snow and ice. If grown in a large container and brought inside during harsh winters, rosemary can grow into a lovely miniature tree! Prune lightly each fall and harvest regularly throughout the growing season.